Meanwhile, both Kentridge’s opera and the museum filled with stuffed wild animals where the seduction scene is set - instead of the Flaubertian cathedral - confront us with audio-visual metaphors. These evoke primarily clocks as metaphors for conquest and trade and hunt for seduction. The connections between the opera and the love affair dawn on visitors, we expect, when they realise that these motives de-naturalise even the most ingrained social structures we take for granted. Who would ever question the usefulness of clocks? The space where this video is screened is semi-closed off from the rest of the gallery, like a small, intimate cinema theatre. In the context of the exhibition, this setting looses its innocence. The theatre is no longer a site to be alone in the dark, because by now visitors are aware of the other visitors around them. This awareness makes sitting in the semi-darkness a very different experience. Also, it is important to realise that this single-screen open piece can be viewed after – according to narrative logic – but also before the visitor enters the cube. The effect will be different, but no less compelling. When one visits the cube first, the mood is likely to turn a bit gloomy; in the other order, one enters the cube with a renewed sense of disappointment. The metaphorical relationship between seduction and hunting has many aspects, not all of which are morally charged. Of course, Rodolphe has behaved like a ruthless hunter, but the young Léon is himself being seduced. True, he fulfills his socially prescribed role as a man in performing the actual seduction, at least in words. 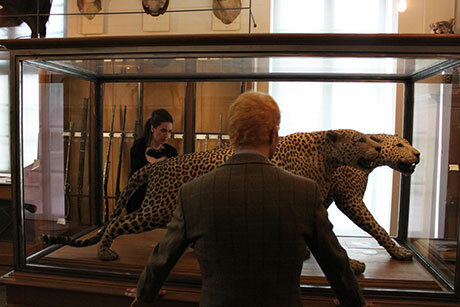 But when we see Léon and Emma walk around the twin leopard encased in a glass vitrine, we cannot help realizing that the hunt is mutual. Rather than opponents, they are twins, taking turns. The latter literally so: when Léon has delivered his romantic love speech. Emma take her turn, turns around, and initiates the kis that selas the pact. But the photograph also suggests an incapacity to make mutuality work. They are both self-involved, looking but not at each other, as if ashamed for the share of disingenuousness they sense in their own craving. The scene questions the culture versus nature divide, confronting the two love hunters with the animal realm where hunting is a matter of survival. Could this be the case for humans as well? The single-screen scene Loving Léon constitutes Emma’s final attempt to escape the tedium of her life and leads straight to her demise. The scene is presented in a cinema setting, in order to allude through the installation mode itself, interdiscursively, to the powerful culture of romance in cinema, which keeps contributing to a social culture of romantic expectations fueled by capitalist attractions. In this scene, the dilemmas around nature and culture resurface and are constantly present, recalling the second scene of Emma’s Education. A second reason to install the piece as an allusion to cinema is the strong narrative mode. The story is simple: during an opera performance Emma meets the young Léon again - the young neighbor with whom she walked in Boredom Sets In. Our video substitutes William Kentridge’s Refuse the Hour (2011) to Gaetana Donizetti’s Lucia di Lammermoor (1831), which is used in the novel. Both operas are contemporary and broach topics of relevance to the time of the novel and our installations, respectively. They engage in an affair, under the pretext of Emma taking singing lessons. Homais, increasingly paranoid, stalks Emma and emotionally blackmails her. The affair ends when Emma asks Léon for money and he refuses to steal for her. The romantic and capitalist lures merge here more intensely than ever.